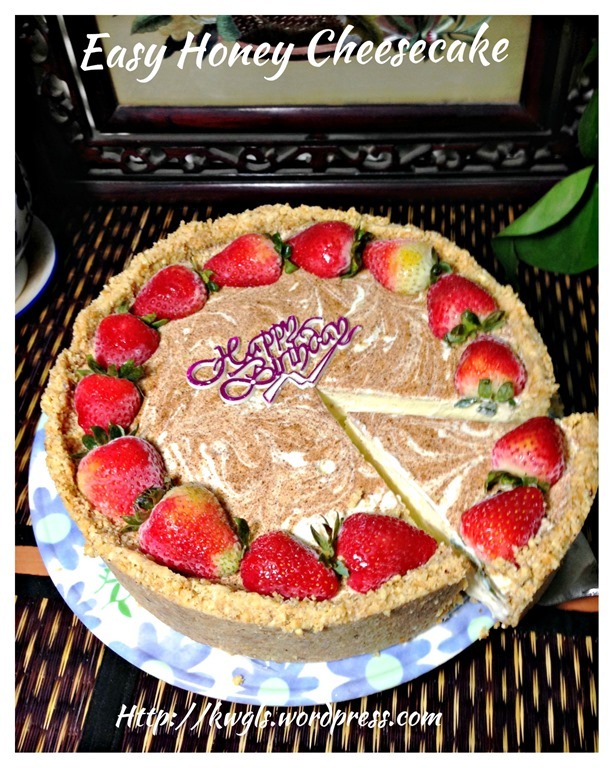 My son was asking me what is the birthday cake that I am going to prepare for him.. I told him and his sister that daddy is never good in any cake decoration, frosting and even dealing with cream… The most I can prepare is just a cheesecake for him. 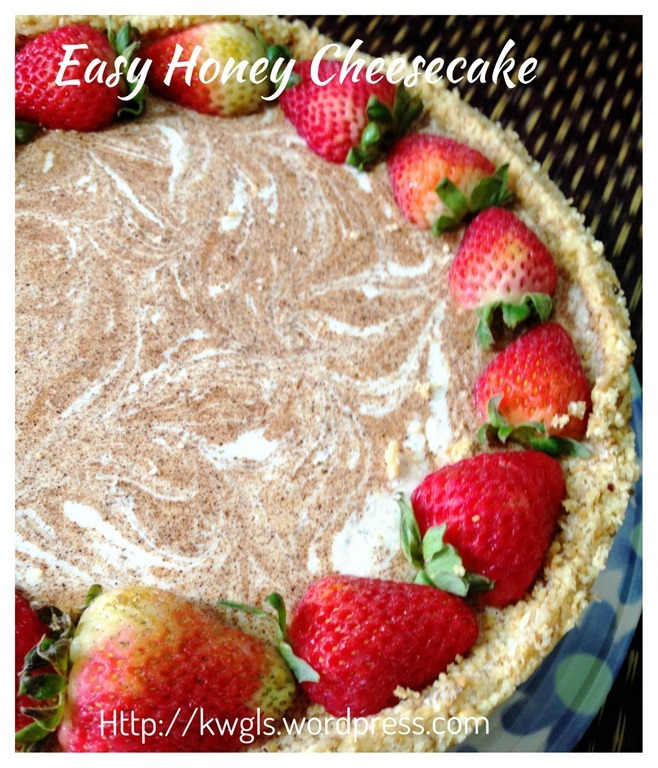 I passed them my favourite cookbook : The Essential Dessert Cookbook for them to choose…After their discussion, they provide me with the picture of a honey cheesecake… As expected, honey is something that they knew and I have concur to “try my best” to prepare the cake for them…Knowing my abilities, I have decided to simplify the cake decoration using fresh strawberry instead of the praline almond crust decoration. 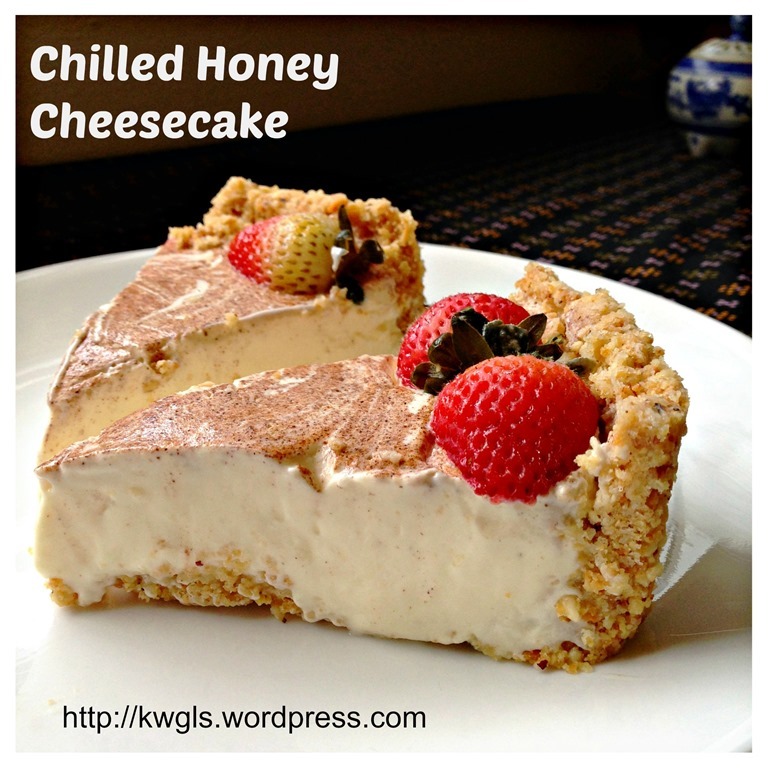 It is a simple and easy chilled cheesecake but taste is very creamy and good. Substitute the mascarpone cheeses with normal cream cheese as mascarpone cheeses are too strong for my liking. Reduction of condensed milk portion as it is too sweet for my taste bud. Uses thicken cream instead of the normal whipped cream as I am running out of normal whipped cream in the house. In addition, I did not whipped the cream as required . 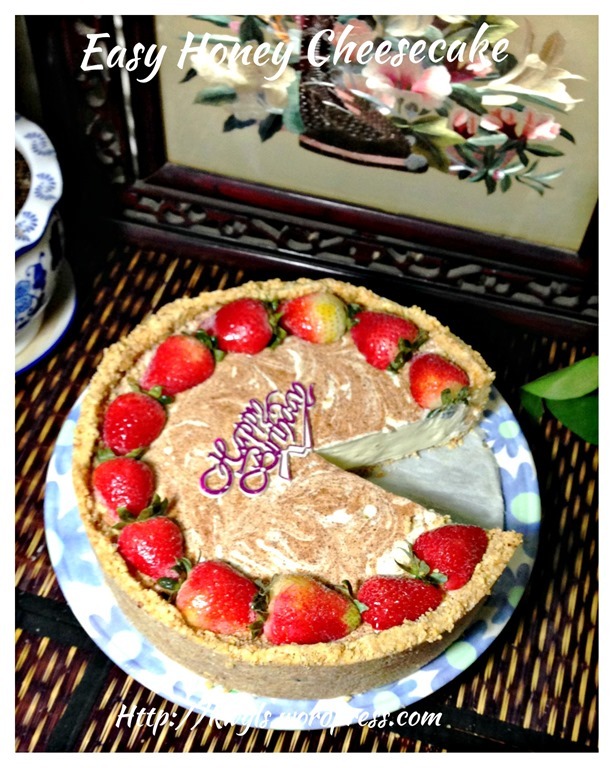 As the cake was cut in the rush and very late at night, I do not have many pictures of cut cake to show readers. I hope readers wouldn’t mind about the images. 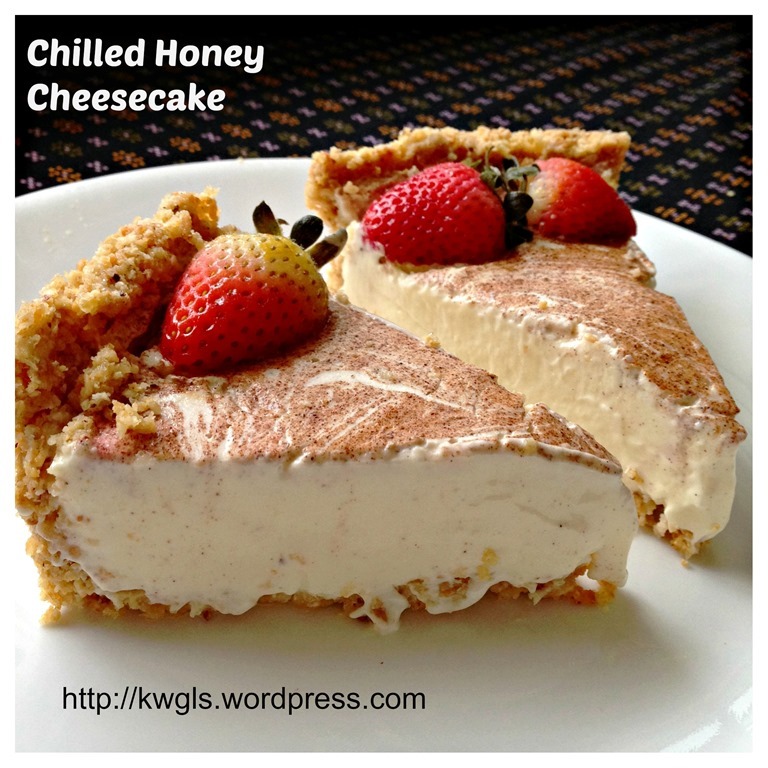 However, I have to warn readers that before proceeding, if you like rubbery cheesecake that are full of gelatine powder (about 4 tablespoons of gelatine powder for 500 grams of cream cheese), this cheesecake is not for you… It will melt rather fast at about 15 minutes in room temperature. 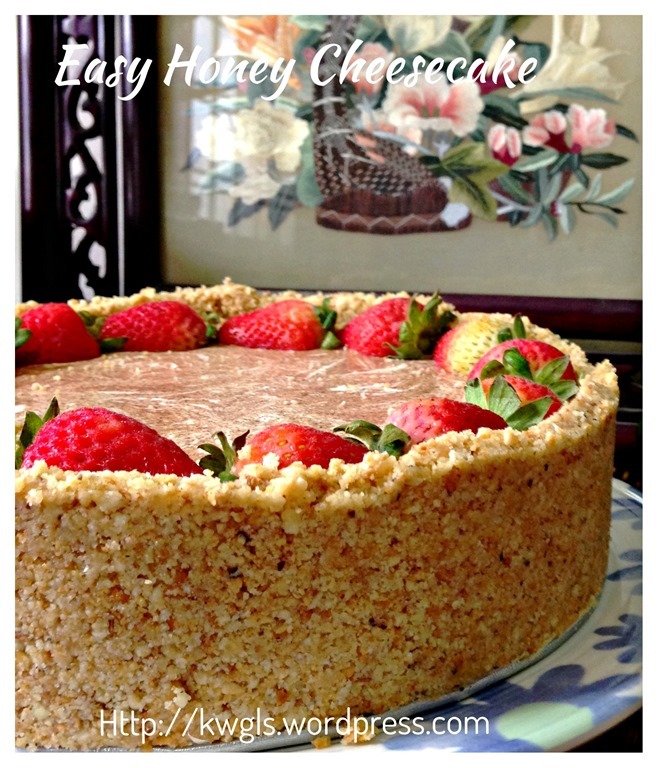 Or you will have to increase the gelatine powder to the amount that you usually used for your normal cheesecake recipe. However, if it is served out of the fridge, it will definitely impress your guest. A baking tin with detachable base or spring form tin. Lightly grease a 9” diameter spring form tin with cooking oil and line the base with baking paper. If you do not have a spring form baking tin, you can use a baking tin with detachable base as in the illustration. 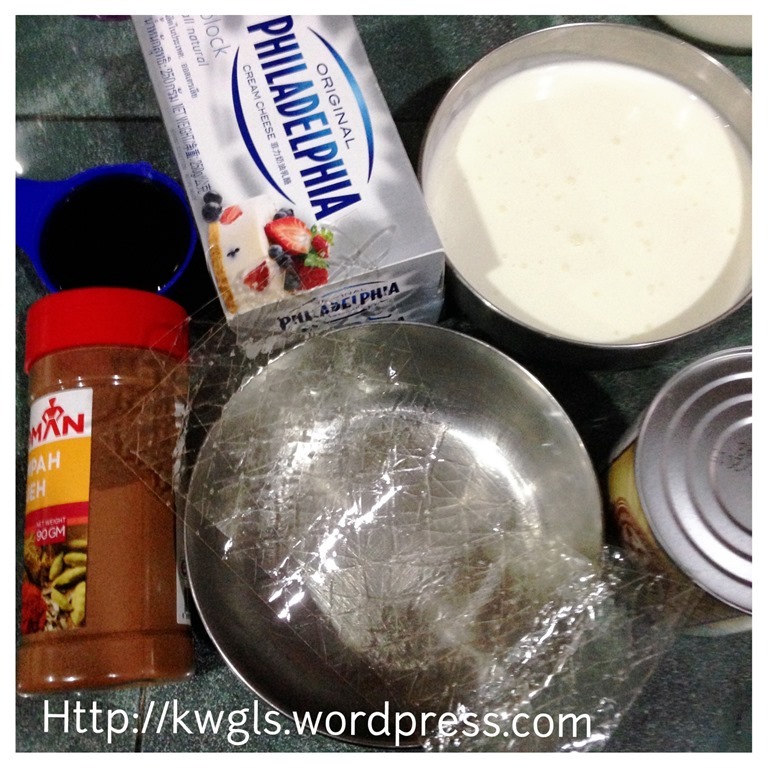 In this case, you will need to line the side of the baking tin with baking paper. 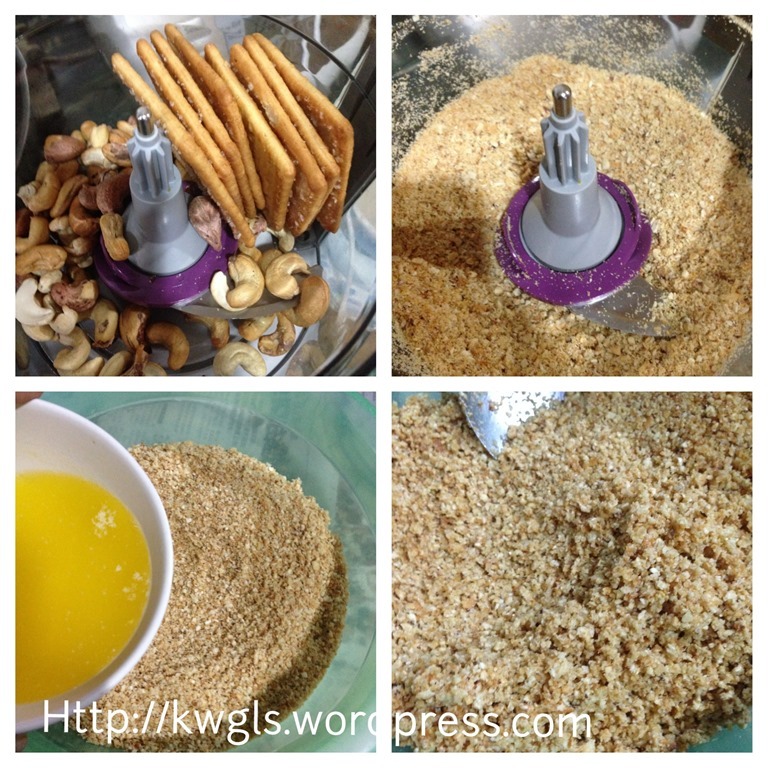 Put the biscuits and nuts in a food processor and blend until fine. If you do not have a food processor, put it in a plastic bag and bang the biscuits or nuts with something hard. 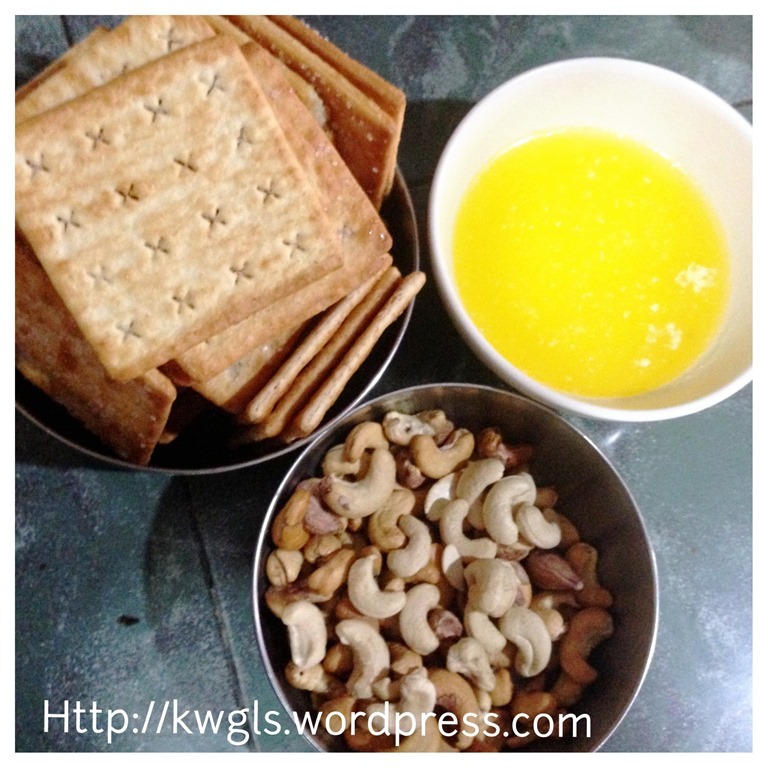 The finer your biscuit and nuts it is, the easier it is for you to prepare the biscuit crusts. Add the melted butter and stir until well mixed. 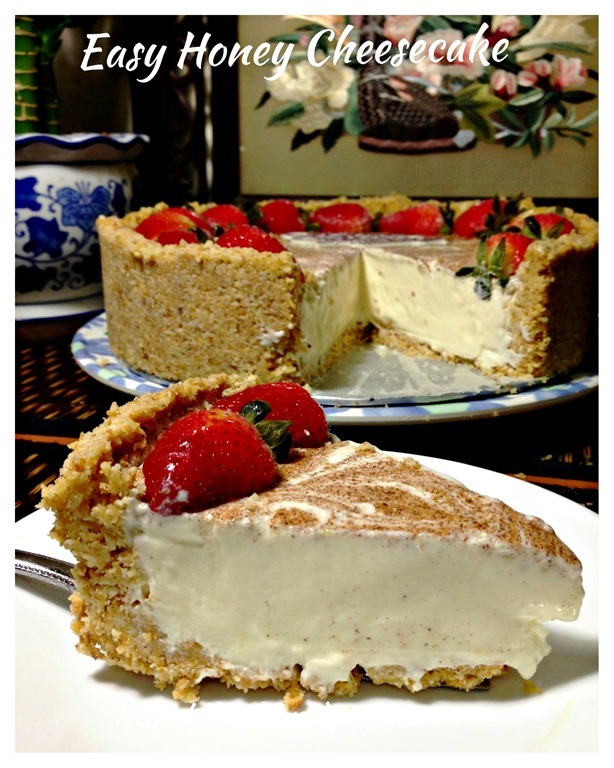 Cream the mascarpone cheese, cream cheese until soft, light and creamy. Add honey, stir until well combined. 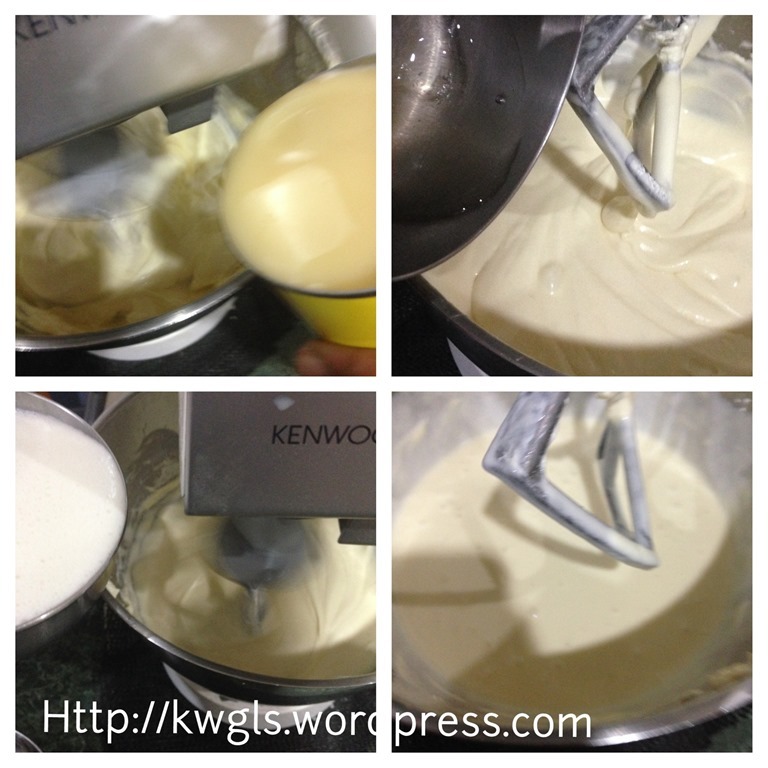 Add condensed milk, followed by gelatine (optional) and cream. Stir until well mix. 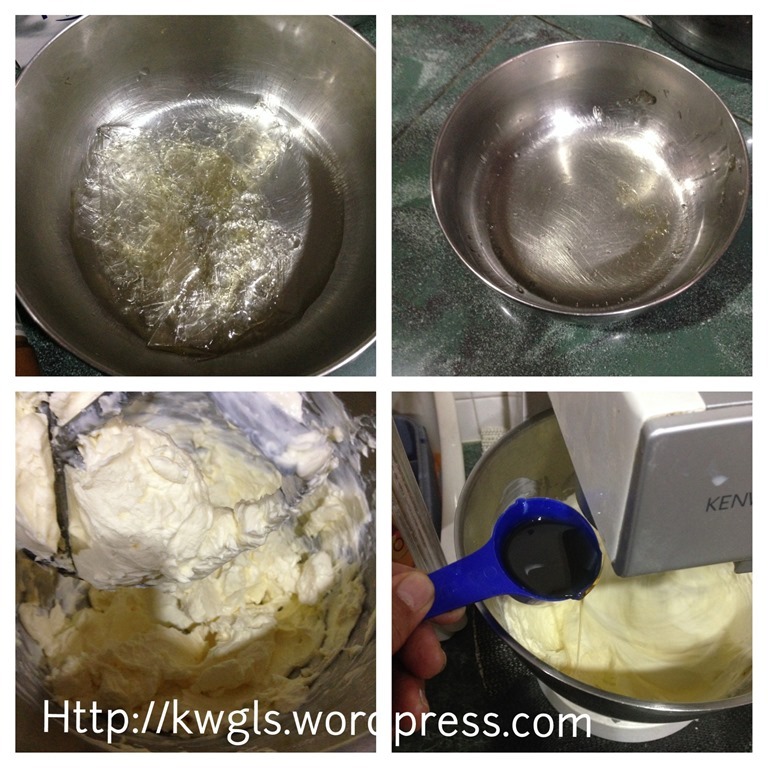 For the cream, you can either add in this manner without whipping or you can whip until soft peak and manually fold in the whipped cream. 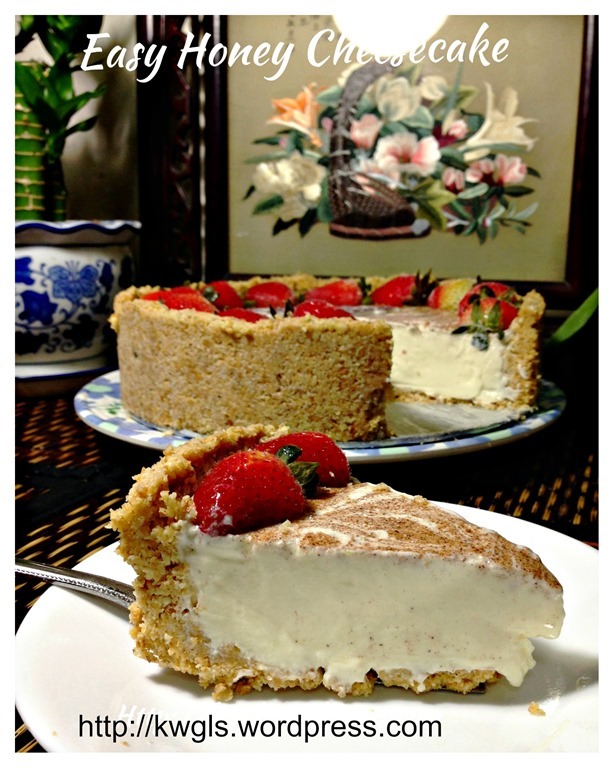 Folding in whipped cream will yield a lighter cheesecake and non whipping will yield a slightly denser cheesecake. 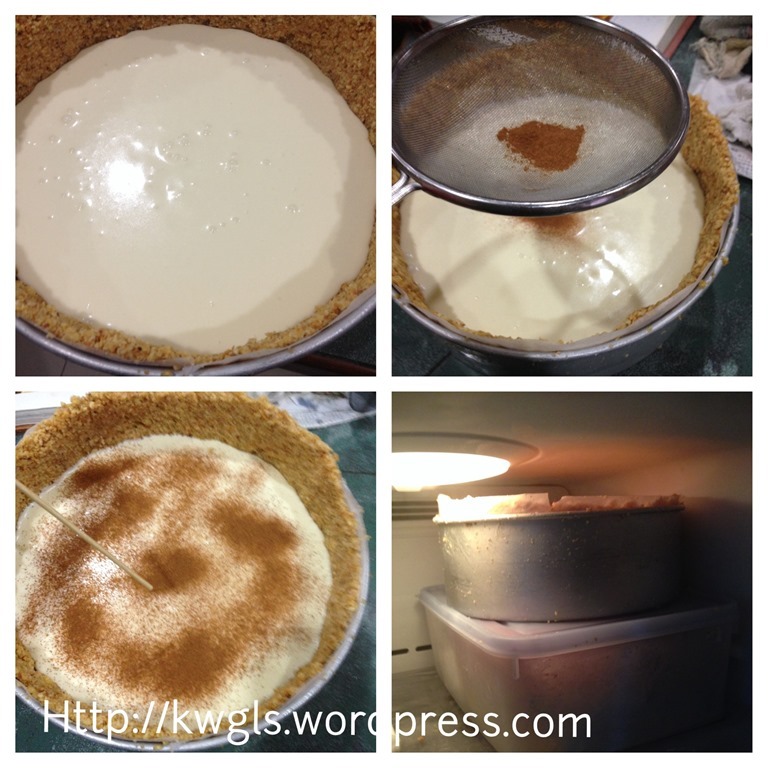 Once done, transfer the cheesecake batter to the prepared chilled biscuit crust. Sprinkle with cinnamon powder or cocoa powder and swirl gently with a skewer. 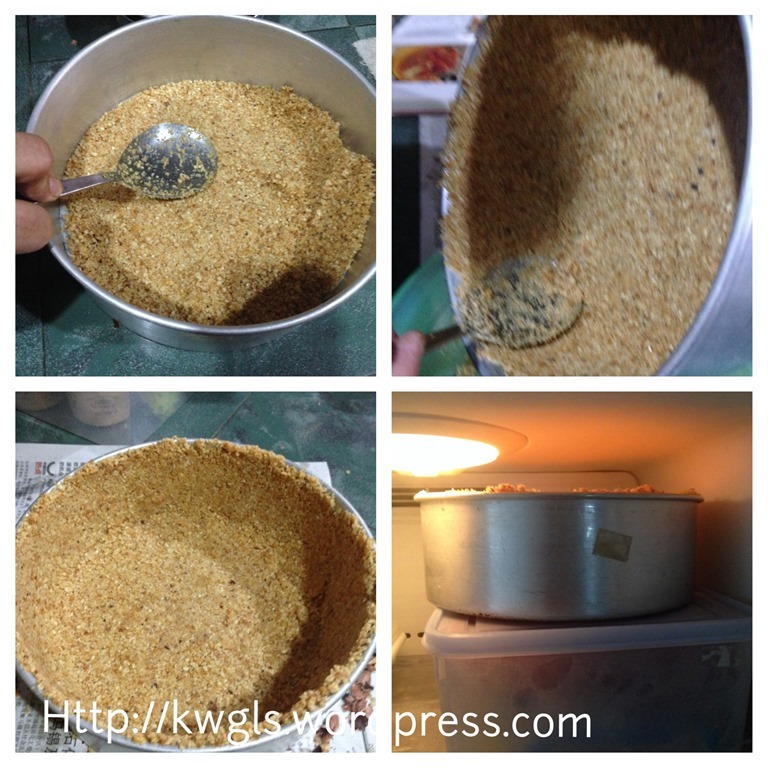 Chilled in the refrigerator for several hours or until firm. It is best to chill overnight. Decorate with your preferred fruits before cutting and serving. The recipe source is from one of my two favourite cookbooks that I have never doubt any recipe written in it. 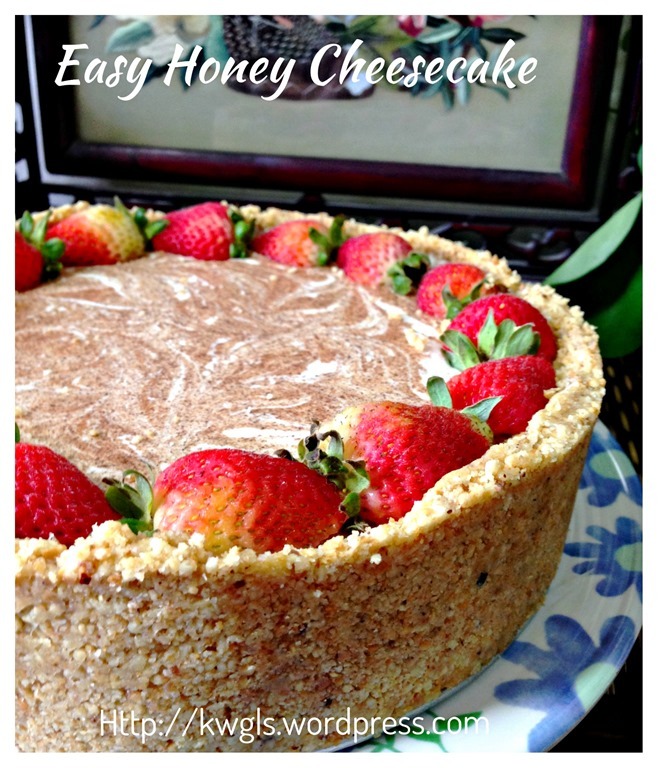 I have tried most of the recipes in the book and all are successful. 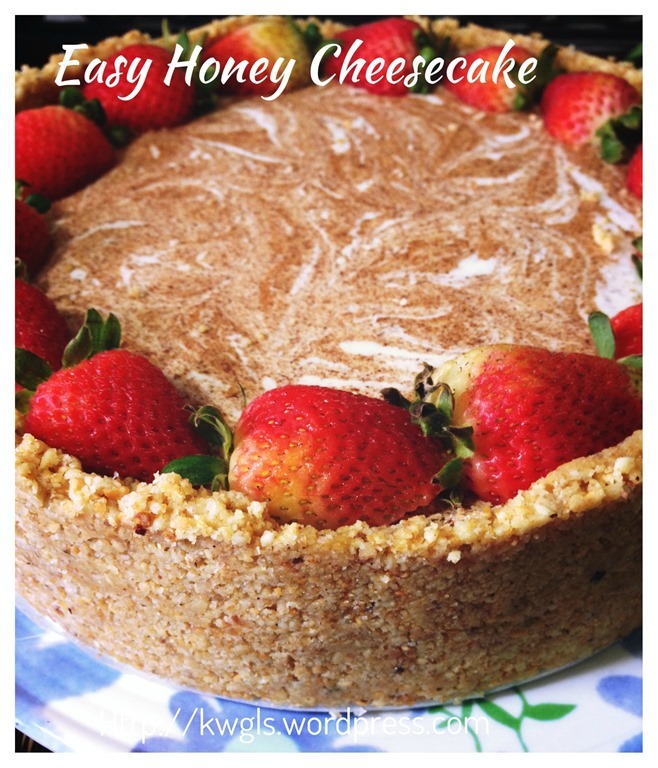 This is a simple cheesecake with great taste and remember, if you want a cheesecake that hold longer in room temperature, you will need to increase the gelatine powder substantially (to about 3-4 tablespoon) and please refer the above procedure for how to add the gelatine. For those who are vegetarians, note that gelatine powder is not vegan and you will have to substitute with some other holding agent or nothing at all as per the original recipe. 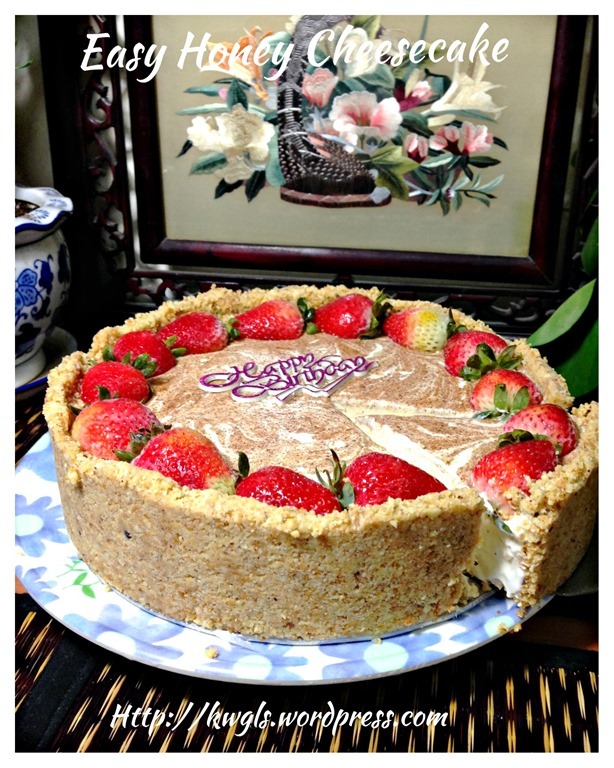 Rest be assured that without gelatine, the cheesecake still taste awesome when it is served right out from the fridge. 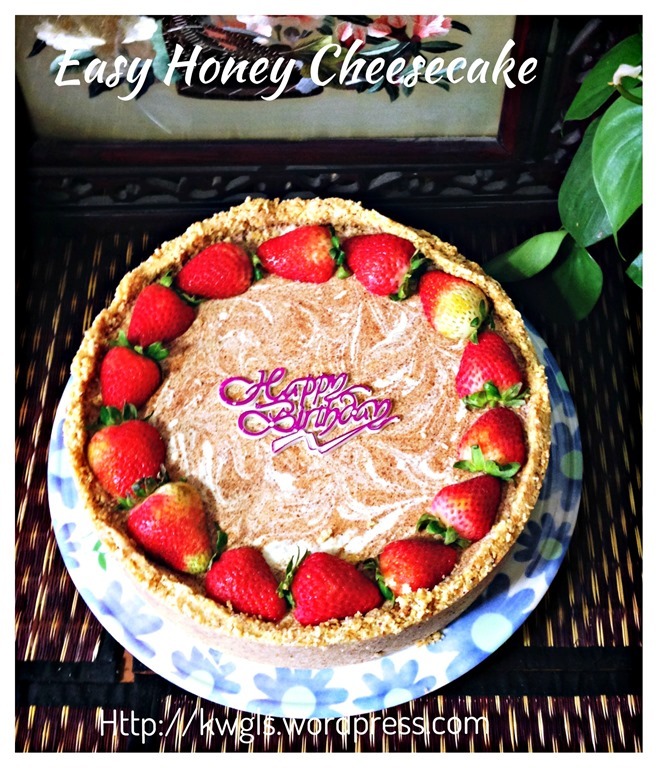 This entry was posted in Cakes and cookies, Food Preparation Series and tagged 8, chilled cheesecake, chilled honey cheesecake, GUAI SHU SHU, Guaishushu, kenneth goh, postaday, 免烤蜜糖芝士蛋糕. Bookmark the permalink. yum, that looks soollll good. Beautiful photos too!!! Just lovely! Pinned! 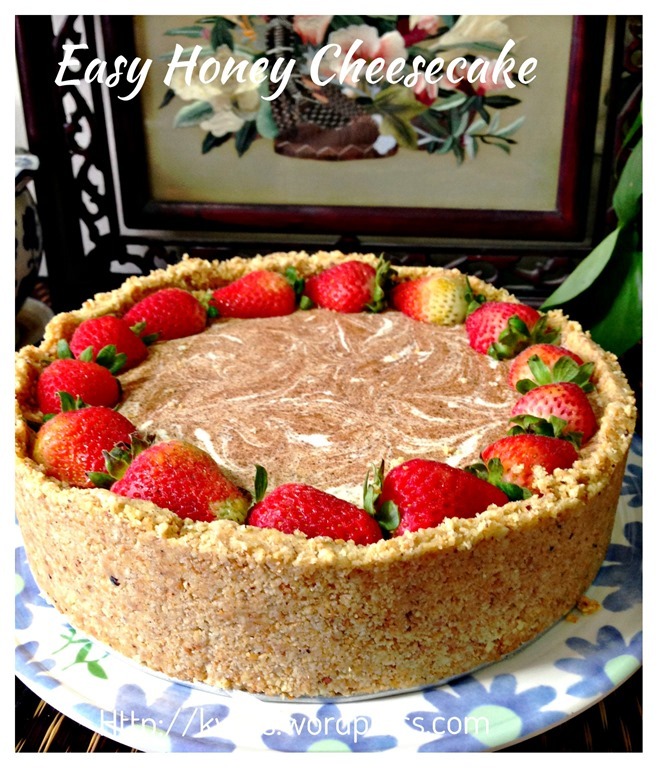 How to remove the cake from mold?